At one time, quite long ago -- A period including the end of my undergraduate studies, the early years of my graduate studies, and the interval between, when I worked a series of low-paying jobs, studied languages, and trained obsessively -- I would unapologetically identify myself as a Nietzschean. That wasn't the hardest thing to do, of course, not least because taking that kind of stance grants a person permission to indulge their appetites and desires, rancor and bitterness, propensities to compete and confabulate, to put others down, to lie to oneself and other under the guise of a higher, more brutal, cleaner honesty. Transgression becomes, if not a duty -- for really a Nietzschean has only self-imposed duties -- a compensation, an exploratory effort, something to enjoy and to bask in. One gets to set oneself within an elite as equally opposed to present, philistine elites as to the mass, to the ordinary, dull people -- though, really, that kind of life, for which Nietzsche's ideas and writings provide articulation, represents a certain shape of adolescence, sensitively spoiled as much as revealingly barbaric. This explains one side of Nietzsche's perennial appeal as a philosopher, an incorporation of his writings into one's lifestyle that I know well myself, having indulged in it, and later, come to feel regret and even embarrassment over. Later, as I studied him more carefully, I came to see that there's so much more of value, depth, attractiveness, rigor to the thought of the twilight philosopher -- actually, a thinker, with whom I disagree on many points, not usually head on, but at tangents, about overall direction, interpretation. 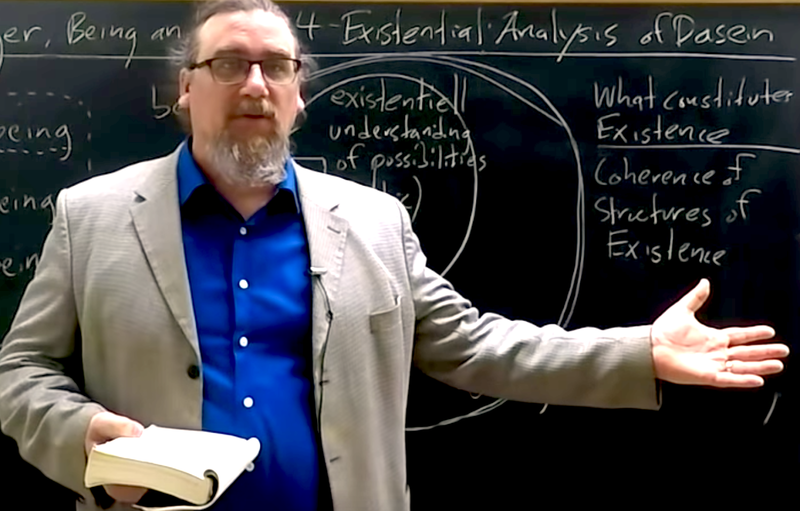 I've recently started offering a sequence of video lectures exploring Existentialism. Among other things, this has had me closely rereading his early great masterpiece, The Birth of Tragedy Out of the Spirit of Music (video lectures one, two, and three available here), a work which I've often taught to students and discussed with colleagues. I've noticed a tendency in readers, on its first few reads, to take a suggestive, seemingly correct, first path, following which cuts one off from seeing the entirety of what's going on in that early book of Nietzsche. There is a fundamental -- and rightly famous -- distinction made from the very start in The Birth of Tragedy, one whose fruitfulness and insight accounts for the work being anthologized so often, and for being read and discussed in a number of fields outside of Philosophy or the History of Ideas: Theater (since it's about drama, after all! ), Art History (because it's about aesthetics), Literature (since it deals with poetry), Religious Studies (myth is a key issue), Gender Studies (Paglia's Sexual Personae being an example). . . the list could go on. It's been a broadly influential work. 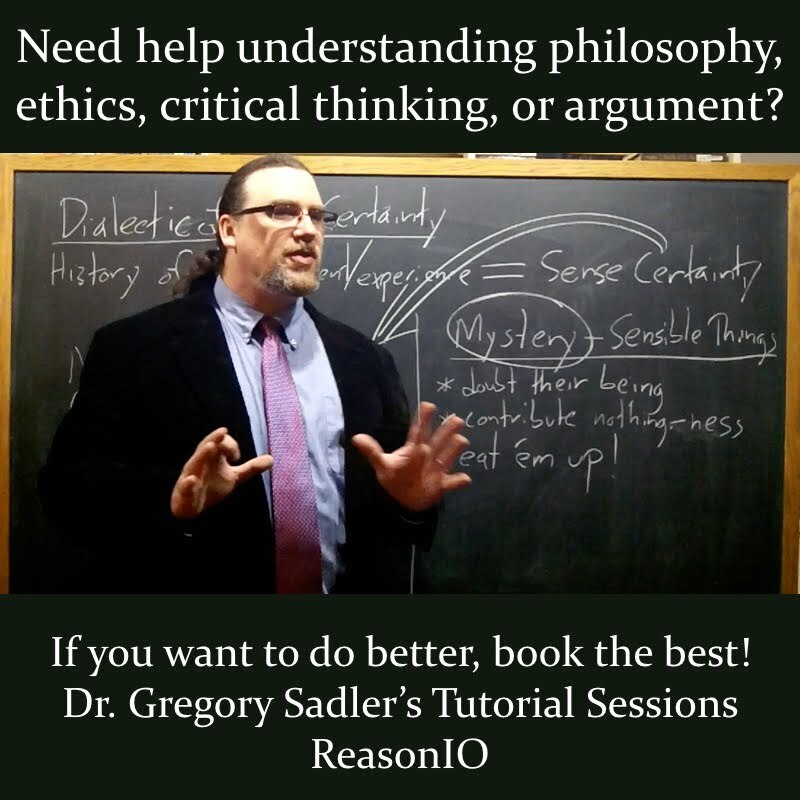 So, what's the key distinction that captured the attention and imagination of thinkers and theorists in so many fields? I have borrowed my adjectives from the Greeks, who developed their mystical doctrines of art through plausible embodiments, not through purely conceptual means, It is by those two art-sponsoring deities, Apollo and Dionysus, so that we are made to recognize the tremendous split, as regards both origins and objectives, between the plastic, Apollonian arts and the non-visual arts of music inspired by Dionysos. What we seem to have here -- the tempting conclusion to make early on and continue through one's reading -- seems to be a clear distinction between two polar opposites, concepts of a classificatory scheme. Through this handy binary lens, art -- including music, dance, sculpture, film, writing -- and by extension, types of thinking, lifestyles, experiences, can be arranged under these two rubrics. Some is clearly Dionysiac, some just as clearly Apollonian -- this assumes, of course that the concept as the classifier understands it actually corresponds to that as Nietzsche takes pains to unfold it and explain it -- and perhaps some lies along a scale, more Dionysiac or more Apollonian. One often hears people -- much more often professors than students -- playing with these ideas in such a way, identifying the experience of feeling one's individuality disappear, losing oneself in a sea of dancing bodies and music at a concert or in a club, as a Dionysiac return to Oneness from the Apollonian illusory everyday where we exist as separate beings. There's something to that, but it reveals more of a mistaken, reductive understanding -- one very much counter to what Nietzsche was actually about -- of these two notions. It makes of them something similar to Marshall McLuhan's distinction between "hot" and "cool" media types -- two opposed terms which are applicable to everything, covering all possibilities. That's not what Apollonian and Dionysiac mean, and that's not how they work. For some time, while I've been rereading, taking notes, and slowly recording the video lectures on the Birth of Tragedy, I've been kicking around the idea of writing several connected blog posts on the work, starting with this one sketching out the main lines of Nietzsche's conceptions of the Apollonian and Dionysiac responses themselves. 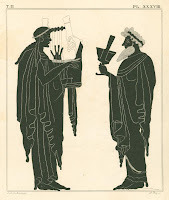 After that, I plan to write one specifically devoted to another equally important response to which he devotes just as much thought and ink as he does to those two: what he calls the Socratic-Alexandrian response. In the third, which will likely have to wait until I carve out the leisure time required, after explaining the productive but unstable synthesis of Apollonian and Dionysian in Greek tragedy, I want to try an experiment -- reading Aeschylus and Sophocles precisely along the lines Nietzsche suggests, reversing our typical prioritization of character over chorus. 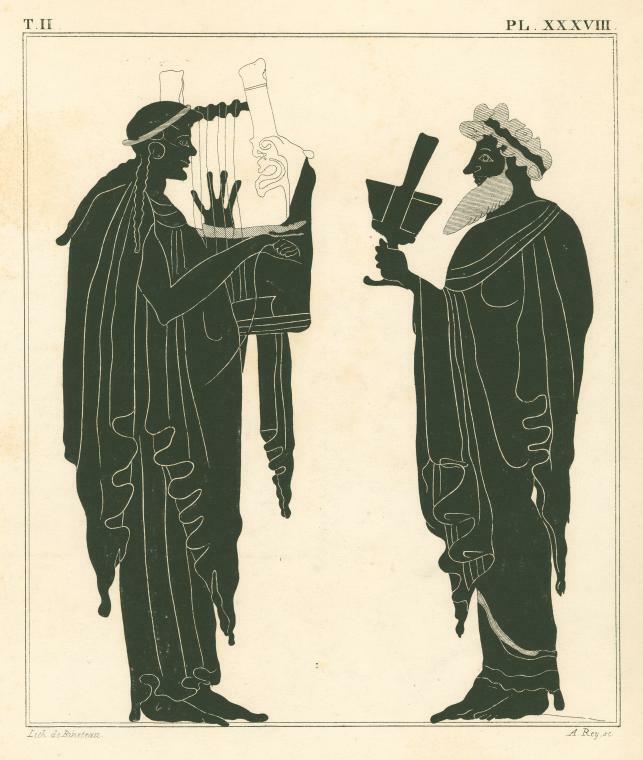 So, what is the Dionysiac? And, what is the Apollonian? Dionysus was the Greek god of wine, and thus drunkenness, revelry, parties -- and not much later, dying and rebirth, worshiped by wild-living, dangerous maenads, and bearded, half-goat satyrs. One might easily get the impression, not least since our language accords the term this connotation, that by "Dionysian" or "Dionysiac," Nietzsche means to signify merely that sort of wildness, communal activity, the breakdown or ebbing of the artificial self of culture, a return to nature and its driving desires for activity, song and dance, sexual coupling, consumption, indulgence. The Dionysiac represents a shedding of responsibilities, individuality, moral judgement and repression -- and correspondingly, an immersion within a sea of other beings, a restoration of previously lost unity, liberation of one's instincts and appetites, dancing, drinking, drumming, witnessing and participating in spectacle, communing with each other in basic human activities and common rituals. Is that what Nietzsche does mean? Well, yes, in some sense. Three things need to be said, though. First, what is all too typically left out of the picture by those who yearn for nature, for the communal, for free-rein instincts released from the yoke of reason, morality, the practical and useful is this: the Dionysiac is just as much cruel and capricious as innocent and joyful, so much so that joy may require sacrifice or scapegoating, cutting and letting of blood, sorrow and suffering, ending and eating of other life. Real dionysiac rituals and societies, outbreaking states and events, are not the narcotic dream of peaceful flower-children, or their analogues of any age. Second, Nietzsche does write of the Dionysiac as occurring, as breaking out, even as institutionalized along some of those lines. But, this represents only a sort of lapse into a different condition, a possession by a kind of force, not a development of human, and thus historical being -- something interesting for those involved at that time, but not something that ultimately matters. Someone getting drunk or high, whether by drugs or desire, spectacle or sacrifice, enthusiasm or copulation, ecstatic, outside of themselves -- that's a response to life that will always be with us, a Dionysiac response, but one that, like a river that, swollen and flooding, overflows its course, does not seek out and by its own body etch down a new path for itself, and leaves only debris in its wake after its release and calming. represent to me, most vividly and concretely, two radically dissimilar realms of art. Apollo embodies the transcendent genius of the principium individuationis; through him alone it is possible to achieve redemption in illusion. The mystical jubilation of Dionysos, on the other hand, breaks the spell of individuation and opens a path to the material womb of being. It is worth stressing two points here. One is that, unlike many philosophers, Nietzsche resists and rejects any compartmentalization of metaphysics, morals, epistemology, and aesthetics -- the real, the good, the true, the beautiful, all of these, along with their opposites, are values, which interpenetrate, contrast, at times jar, and at others demand each other. The other is that Nietzsche realizes that art arises not only from a desire to create, or as embellishment of more utilitarian objects and purposes, but out of our need -- a need to find consoling, useful, workable responses to the problem, the mystery, the sorrow of Life. Art, even understood broadly, is not the only medium for responding to this motive, but it is the one which provides the highest resolutions -- it is the register for the noble soul's responses. Both of these tendencies, forces, approaches, whatever notion one wants to use for them, are also human responses to the reality with which they are faced. There's a double sense in which this can be understood. If you are thinking about Apollonian and Dionysian in terms of artistic production, of poesis, or of the products of art, the standards for judgement or enjoyment of art, and those uses themselves, i.e., the consumption of art in which it finds a certain consummation, then the artist and the audience are both involved in reacting to reality in two very different manners, exploring which is helpful, particularly for understanding the Apollonian pole of the opposition. The Apollonian artist works, as Nietzsche says, within the medium of images, distinct from each other, given form which is itself a forceful imposition on the shifting shapes of reality, connected together in greater, structured complexes, like the plot of a story, for instance, or the dialogues between characters. The archetypical Apollonian activity, however -- the production everyone, artist or not, inherits as a capability -- is the dream, contrasted against the Dionysiac state of intoxication. Here we enjoy an immediate apprehension of form, all shapes speak to us directly, nothing seems indifferent or redundant. . . .The person who is responsive to the stimuli of art behaves toward the reality of the dream much the way the philosopher behaves toward the reality of existence: he observes exactly and enjoys his observations, for it is by these images that he interprets life, by these processes that he rehearses it. Nor is it by pleasant images only that such plausible connections are made: the whole divine comedy of life, including its somber aspects, its sudden balkings, impish accidents, anxious expectations, moves past him. . . All these facts clearly bear witness that our innermost being, the common substratum of humanity, experiences dreams with deep delight and a sense of real necessity. But the image of Apollo must incorporate that thin line which the dream image may not cross, under penalty of becoming pathological, of imposing itself upon us as a crass reality: a discreet limitation, a freedom from all extravagant urges, the sapient tranquility of the plastic god. . . . One may say that unshakable confidence in that principle [of individuation] has received its most magnificent expression in Apollo, and that Apollo himself may be regarded as the marvelous divine image of the principium individuationis, whose looks and gestures radiate the full delight, wisdom, and beauty of "illusion." By contrast to this, of course, the Dionysiac involves the breakdown of individuation, of distinction, compensated for by involvement, by fusion, a condition in which "not longer the artist, he has himself become the work of art." Nietzsche takes pains to stress a distinction mentioned earlier here, "the profound gap separating the Dionysiac Greeks from the Dionysiac barbarians." What makes the difference there is what he calls an eventual "pacification." First, there is force that braces back the flood, checks the flux into images. Eventually, a productive truce between these two warring principles works itself out. The two great antagonists have been reconciled. Each feels obligated henceforth to keep to his bounds, each will honor the other by the bestowal of periodic gifts, while the cleavage remains fundamentally the same. [I]n those places where the first assault was withstood, the prestige and majesty of the Delphic god appeared more rigid and threatening than before. the only way that I am able to view Doric art and the Doric state is as a perpetual military encampment of the Apollonian forces. An art so defiantly austere, so ringed about with fortifications -- an education so military and exacting - a polity so ruthlessly cruel -- could endure only in a continual state of resistance against the titanic and barbaric menace of Dionysos. This almost sounds to the late modern, romantic, or sentimentalist ear as if Nietzsche is playing on the old trope of an imperialistic reason or rationality, hypocritically imposing its reign upon its Other, demonizing it as chaotic, the better to penetrate, extend itself into, dissolve and harness the vital, the instinctual, the unstructured and spontaneous, the primitive and barbaric. One might well read something like that into the third main response Nietzsche discusses in the Birth of Tragedy, the Socratic-Apollonian, which in the modern age becomes the dominating dogma of scientific mentality. We may infer there is one norm only: the individual -- or more precisely, the observance of the limits of the individual: sophrosune. As a moral deity, Apollo demands self-control from his people and, in order to observe such self-control, a knowledge of self. And so we find that the esthetic necessity of beauty is accompanied by the imperatives, "Know thyself," and "Nothing too much. One might be tempted to think that it is by following its own internal imperative of judiciousness, of limitation, of maintaining serenity that the Apollonian would refrain from pressing its advantage and its case entirely, repressing the Dionysiac completely, or at least casting it into the outer darkness of barbarism. That's not the case, however, because the Apollonian requires the Dionysiac, not least because, as Nietzsche says, the classic Greek realizes "that his Apollonian consciousness was but a thin veil hiding from him the whole Dionysiac realm" -- or put in mythic terms, that "the Apollonian need for beauty had to develop the Olympic hierarchy of joy by slow degrees from the original titanic hierarchy of terror." The Apollonian not only comes after the Dionysiac. It not only rides above a substratum that does not, for being covered, disappear. It demands the Dionysiac so that the images, once created, can become something greater, and can avoid degenerating into a mere, sterile play. [The Greeks] felt more than that: their whole existence, with its temperate beauty, rested upon a base of suffering and knowledge which had been hidden from them until the reinstatement of Dionysos uncovered it once more. and lo and behold! Apollo found it impossible to live without Dionysos. As Nietzsche describes it, the Dionysiac reveals a deeper wisdom, an insight into the nature of reality itself, but it also typifies a response to that, a response which differs from the reality to which it responds. What is that reality? At its very base, the world, reality itself is meaningless, absurd. It is, and it is what we are stuck with, nothing more -- that is the blasting view, the nihilism, that underlies Nietzsche metaphysical vision, as well as the problem to which his aesthetics and moral theory respond, not least by exploring and celebrating what he deems to be healthy life-affirming responses to this ultimate void of meaning. The Dionsiac response, through music, through will, through intoxication, peels away appearances and phenomena, illusions and individuation -- but perhaps not entirely. What does it reveal? Three different though not incompatible themes. The first represents desire, life, joyfulness. being compassionate as well as wise, it [the chorus] proclaims a truth that issues from the heart of the world. despite every phenomenal change, life is at bottom indestructibly joyful and powerful. Dionysiac art. . . wishes to convince us of the eternal delight of existence, but it insists that we look for this delight not in the phenomena, but behind them. The second theme is that of the gulf of nothingness, and what it produces in the being conscious of it. desire reaches beyond the transcendental world, beyond the gods themselves, and existence, together with its gulling reflection in the gods and an immortal beyond, is denied. The third theme, meditating upon which leads us into the heart and essence of the tragic vision and experience, as Nietzsche powerfully portrays it, intersects with these other two -- a metaphysics of striving, conflict, right, and suffering. This is no placid metaphysical monism, in which by effacing the self -- and particularly the will -- a person would reunite with the comforting, perfectly consistent, static One. The Dionysiac vision underlying and culminating in tragedy introduces a world in which metaphysics and morality, equally real, necessarily jar, not with each other so much, but within each register. I'll end the first installment of this study with the two passages that best convey that perspective. The profound poet tells is that a man who is truly noble is incapable of sin; though every law, every natural order, indeed the entire canon of ethics, perish by his actions, those very actions will create a circle of higher consequences able to found a new world on the ruins of the old. The tragedy at the heart of things, which the thoughtful Aryan is not disposed to quibble away, the contrariety at the center of the universe, is seen by him as an interpenetration of several worlds. . . each individually in the right but each, as it encroaches upon the other, having to suffer for its individuality. We may expose the Janus face, at once Dionysiac and Apollonian, of the Aeschylean Prometheus in the following formula "Whatever exists is both just and unjust, and equally justified in both.